Prototype: High speed train painted and lettered for the THALYS PBKA of Thalys International, Brussels, Belgium in the multi system version for service between Paris, Brussels, Cologne, and Amsterdam. 1 intermediate car R4, bar car 2nd class, and 1 intermediate car R5, 2nd class. The newest paint scheme. The cars look as they currently do in real life in 2012. 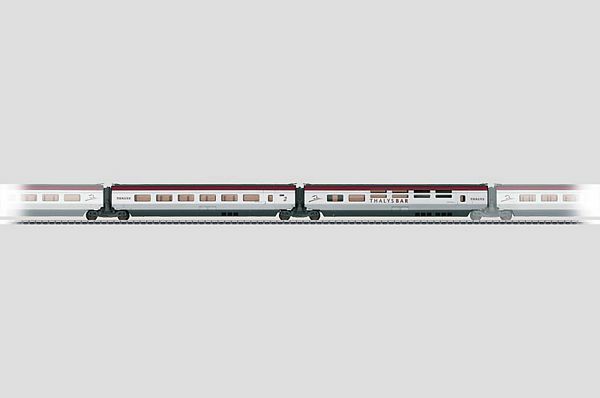 Model: This is a 2-part add-on car set for lengthening the THALYS PBKA high speed train, item no. 37794, to a 10-car unit. The cars have factory-installed interior lighting with maintenance-free, warm white LEDs. The interior lighting is powered through a continuous electrical connection through the entire train. The two intermediate cars are permanently coupled together. There is a guide mechanism in the Jakobs trucks. The cars are a scale reproduction. The minimum radius for operation is therefore 360 mm / 14-3/16", when there is sufficient clearance on both sides. Length of the pair of cars 43 cm / 16-15/16". The 37794 basic set can be expanded with the 43424, 43434, and 43444 extension sets to a prototypical 10-car unit.